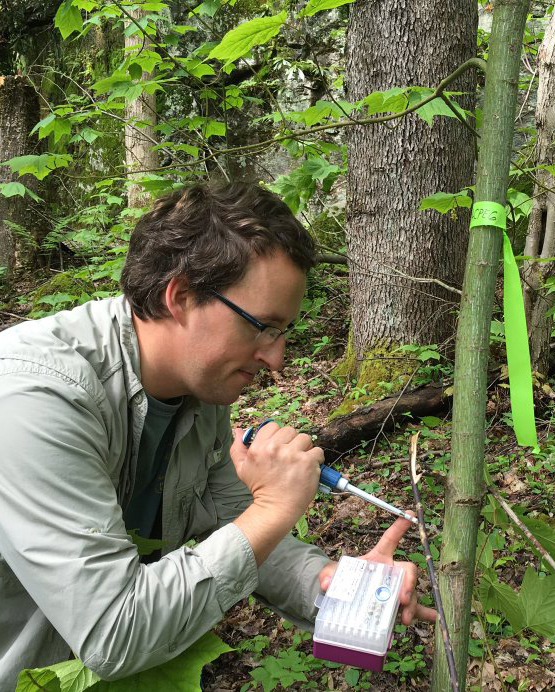 We’re excited to welcome our next curator, Matt Kasson (@kasson_wvu) to Real Scientists! Matt is an Assistant Professor of Plant Pathology at West Virginia University, US, where he is working on research related to forest health. We asked Matt our usual set of questions, you can read his responses below. Plant Pathology is a true multidisciplinary field. It is the perfect marriage of entomology, plant pathology, genetics, biology, ecology, and environmental microbiology among other disciplines. There is plenty enough here to keep me busy and interested for the span of my career. I have three main areas to my research program here at WVU. The first is fungus-arthropod interactions in forested ecosystems including parasitism and mutualism. I focus primarily fungal symbionts of bark and ambrosia beetles as well as fungivoous millipedes and their fungal communities. I am also conducting research on the use of entomopathogens as fungal biological control agents of invasive insect pests.The second area of study is in fungal biocontrol of invasive plants. I use native fungi to combat some of the most entrenched and noxious invasive plants including the tree-of-heaven. My third area of study is in etiology of canker diseases of trees, mostly angiosperms. Currently I am working on several canker diseases including thousand cankers disease of walnut, Fusarium canker of various hardwoods, Neonectria target canker, Chestnut blight, and Diplodia canker of oak. I mainly focus on forest health. Many of our forests are plagued by forest pests and pathogens that threaten the functions of these forests. If forests are the lungs of this planet, I suppose I am forest pulmonologist, trying to figure out the causes of persistent dysfunction in trees. The perfect day off I spend in the forest with my kids, doing science. I’m the father of three young boys (Wyatt-5, Oliver 1, Andrew 6 weeks). Wyatt wants to be a shark scientist and illustrator (he says he wants two PhDs). Our family along with our dog Elle spent a lot of time exploring state parks in WV and beyond looking for unique fungi and arthropods. Please welcome Matt to Real Scientists! Previous story Safari through the Universe: Karen Masters joins Real Scientists!